Look, I don’t know how to tell you this, but your kid probably is a superhero. Don’t believe me? Just ask them. I know, this is big news. Well mainly because being the parent of a superhero is a big job! Besides for the general cleaning and feeding duty, you now have the colossal task of keeping your masked crusader in tip top shape and ready for action! Well friend, don’t worry, I’ve got you. I suggest you support your little champions escapades by taking them to the Superhero Fun Run this coming weekend. I mean, it’s a no brainer – an undercover superhero conference cleverly disguised as a fun run and carnival in aid of Hospice! You should totally go. And I’m giving away some tickets for you to do just that! 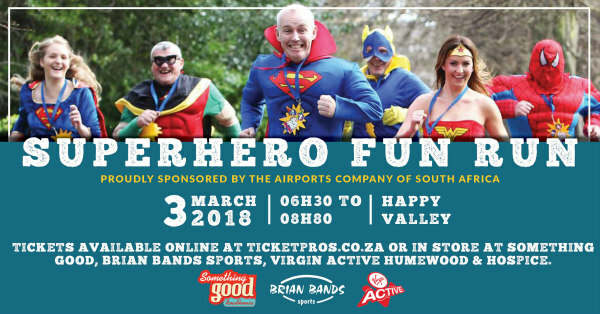 St Francis Hospice’s fun run and carnival takes place on 3rd March in Happy Valley, Nelson Mandela Bay, and it’s going to be exactly what superhero dreams are made of. I’m sure of it. Well, for starters all participants are encouraged to wear a superhero outfit. (Uhm, yes please!) and secondly there will be a bunch of fun activities for the entire family. From performing artists, food stalls and jumping castles, to lawn games and face painting. And guess what, you could even nab the best-dressed Superhero prize! The event will also be entered into the Recordsetter contest to officially own the record for the largest Superhero Fun Run. So you’ll pretty much be making history. I know, right? The 3km walk starts at Happy Valley at 07:00, and will proceed down Marine Drive, ending off in Happy Valley again. Entry, including access to the Carnival, is R60 per adults, R30 per child and R150 for a family of four. Corporate packages, from R900, allow branding on the roadside and entry for five staff members, who each receive branded capes and masks. Enter online at Ticketpros or at Jet, Edgars & Postnet. Tickets can also be purchased from Something Good, Virgin Active Humewood, Brian Bands and at St Francis Hospice. Entry to the Carnival is R20 for adults and R10 per child. To book your spot to exhibit in our Health and Wellness tent, to sell food or other products, to volunteer your services, donate goods, enter our fun-run or enquire how Hospice can help you, contact Lynn van Vuuren via 041 360 7070 or email. Check out the Hospice facebook page or website for more deets. WIN a family package for you and your family! Simply visit this post on my Facebook page and tag a friend whose kid is also a superhero (or who would totally enjoy attending the Superhero Fun Run. Winner announced on Friday, 2nd March. Hospice provides Home-Based Palliative Care monthly to some 200 terminally ill Cancer, HIV/AIDS and Motor Neurone Disease patients in the Nelson Mandela Bay Metro and Kouga region – at no cost to the patient. It believes that no one should be in pain or alone during their last days. Social Workers on the Hospice team not only provide comfort, but play a significant role in facilitating guardianship, fostering, grants and schooling for affected vulnerable children. Hospice visits the families for a time after the patient has passed on to make sure they are coping and healing. SFH is a registered NPO, PBO and an exempt micro enterprise that lends 135% to the BBBEE scorecard for procurement recognition and provides Section 18A receipts enabling a tax rebate. Many have been touched by Hospice which has built a credible record of quality care since 1986.